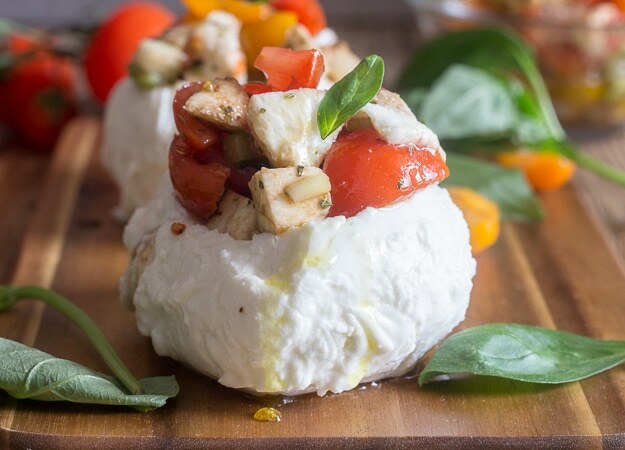 Easy Stuffed Fresh Mozzarella Caprese, the Italian dish that screams Summer. 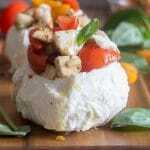 Fresh mozzarella, tomatoes and herbs make this the perfect side dish, appetizer or even main course. You are going to love it. Yes you read that right! And I know what you are thinking, this woman is going Caprese crazy. Well, just a tad and I really can’t help it, I live in Italy. But this Stuffed Fresh Mozzarella Caprese is exactly the caprese you are looking for, trust me. I was so excited about making and eating this dish that I forgot to take a couple of ingredient photos, so too bad I remade it! I can’t say anyone complained. This is one of those quick and easy but isn’t that cute ideas. 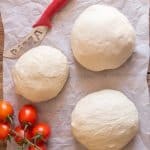 If you use a couple of medium to large fresh mozzarella (depending on what size they are where you live), it would probably be enough for 4 to 6 people. My first recommendation would be to let the fresh mozzarella drain for about 20 minutes in a sieve over a bowl. While it is resting and draining, start chopping the tomatoes, celery, onion and some wonderful perfumed basil (that you could easily grow in a small pot). Place it all in a bowl and toss with olive oil and balsamic vinegar. Then all you have to do is hollow out the drained mozzarella , and that extra mozzarella gets chopped up and added to the cut up tomato mxture. 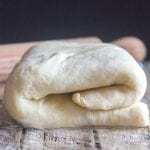 Fill the hollowed out mozzarella with the mixture, drizzle with a little olive oil and serve. Any extra tomato mixture is absolutely delicious served with some Crusty Italian bread. This dish makes the perfect BBQ side dish. Italians have a wonderful way of expressing themselves, for example, herbs and food don’t have a smell they have a perfume. Perfect in my opinion, especially in regards to basil. You know summer has arrived when you smell basil in the air. Just remember when you hollow out your fresh mozzarella, be gentle you don’t want to rip it. 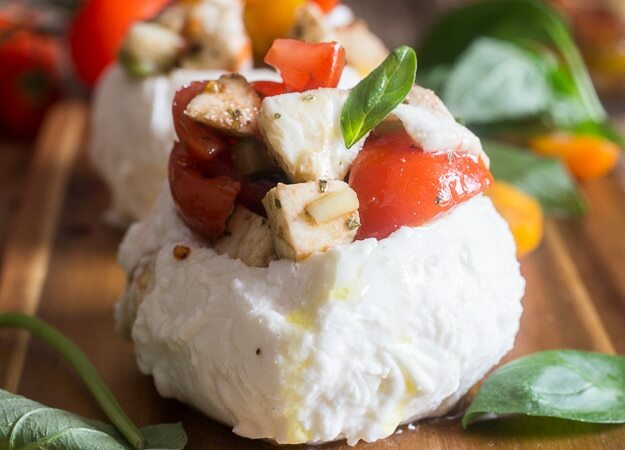 Easy Stuffed Fresh Mozzarella Caprese could easily become the perfect side dish for any summer barbecue, make it really yell summer and serve it with some Bruschetta. Buon Appetito! 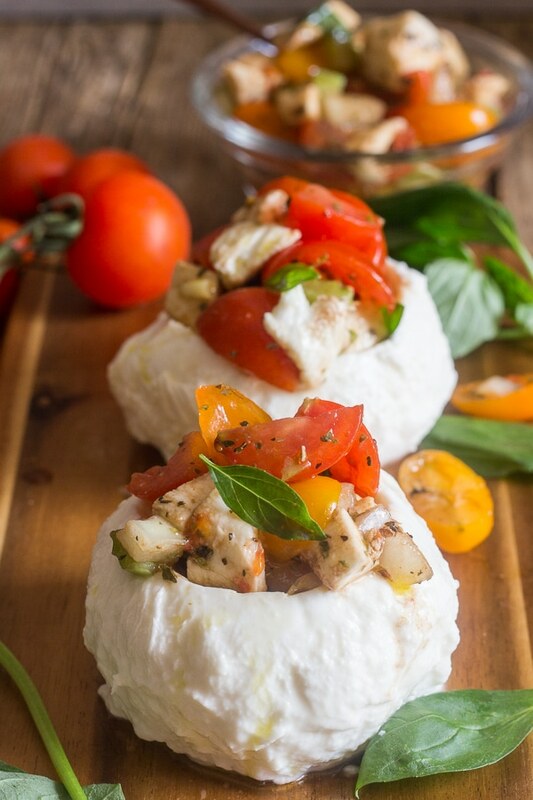 Easy Stuffed Fresh Mozzarella Caprese, the perfect Summer Appetizer idea. A fresh healthy vegetarian, gluten free Salad Recipe. Place the fresh mozzarella in a sieve over a bowl for approximately 20 minutes. Carefully hollow out the mozzarella and chop the excess mozzarella. In a medium bowl combine, chopped excess mozzarella, chopped tomatoes, onion and celery, oregano, salt, chopped basil, olive oil and balsamic vinegar, toss gently together. 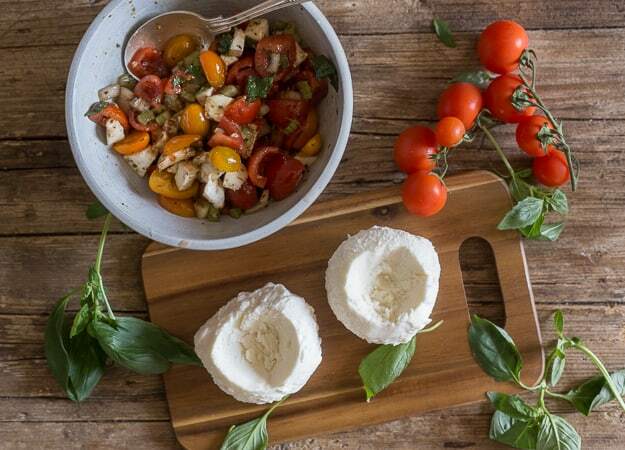 Fill the hollowed out fresh mozzarella with the caprese mixture and drizzle with a little olive oil, serve the extra caprese mixture on the side. Serve immediately. Enjoy! Republished from June 12, 2016. Hi Stephanie, hope you enjoy it! These sound incredible! I can’t wait to try them 🙂 Thanks for linking up with Merry Monday this week. Thanks Emily, hope you enjoy it! 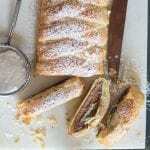 I’ve just seen these on FoodPornDaily and, they look sooooooooo unique. Hi Winnie, thanks hope you enjoy it! This is amazing!! So genius to stuff the mozzarella!! Lol, I just made this but inverted, I stuffed round tomatoes with the same ingredients minus the Balsamic vinegar, have to try your yummy recipe next time ???????????????? Hi Olympia, that’s a great idea too! I love the combination. Hope you like it. This is gorgeous Roaemary!!! 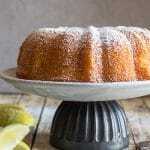 Something I could bring along to a bbq- I know it will be gone in minutes! Looks so fresh – beautiful photos! Thanks Veronica, really quick to make too, I love fresh, especially with this horrendous heat we are having. I certainly would have made it again. And again. And again. Cheese is one my weakness and mozzarella tops the list along with quite a few others 🙂 Your tomatoes look beautiful!! Our weather here has been so rainy I doubt our tomatoes will be very good 🙁 Great recipe and thank you for sharing!! I’m looking forward to see your next “caprese” recipe. Are these your tomatoes or your MIL?? Thanks Marisa, especially with the heat, anything cool is appreciated. So sorry to hear you have so much rain, hope it dries up a bit for your tomatoes. Actually neither, I would say a couple of more weeks and they will be ready. Keep you posted.